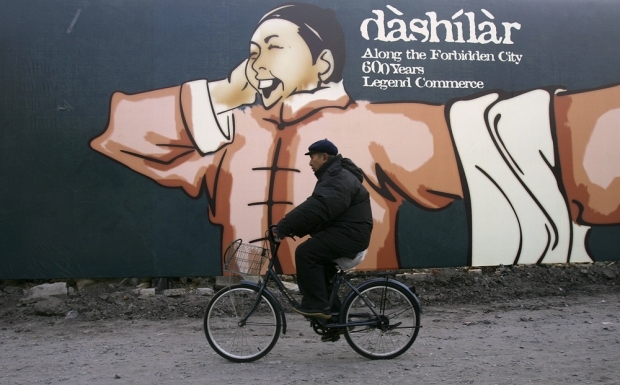 A cyclist passes a billboard on Dashila Street, on December 19, 2006 in Beijing. Dashila Street is more than 600 years old and one of the oldest pedestrian shopping districts in Beijing with century-old shops and restaurants. The ancient street was under reconstruction as a cultural tourist attraction in the lead-up to the 2008 Olympic Games. Today, we’re pleased to share a special live edition of Sinica recorded last Saturday at Capital M in Beijing. Held to a standing-room only crowd, we talked all about our ongoing love-hate relationship with Beijing, and asked what on earth is happening to the city that so many of us have known since the 1980s and even earlier. As housing prices and rents soar, hutong get ripped down, and “crazy bad” air becomes the new normal, will Beijing maintain its heart as a cultural capital, or is the city losing itself and our affections? Filled with stories of pig excrement, SARS babies, and enough Chinese cursing to satiate even the Beijing Profanity Alliance, this show was a pleasure to put on and we were really glad to see everyone who came out. Joining Kaiser Kuo on stage were two Sinica stalwarts: Chinese media expert Jeremy Goldkorn and David Moser, jazz pianist and head of the CET Beijing program. We were also thrilled to be joined by Zha Jianying, author of China Pop and Tide Players, and a now-expat Beijinger from New York who admits to being torn between her two homes.